Recently, we described the identification of novel streptococcal superantigens (SAgs) by mining the Streptococcus pyogenes M1 genome database at Oklahoma University. Here, we report the cloning, expression, and functional analysis of streptococcal pyrogenic exotoxin (SPE)-J and another novel SAg (SPE-I). 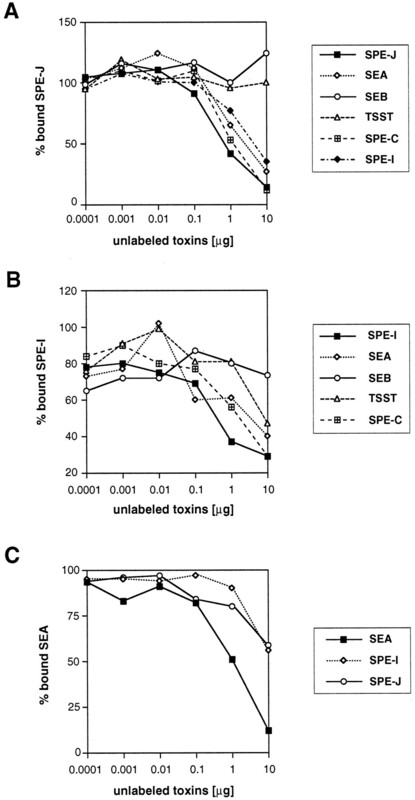 SPE-I is most closely related to SPE-H and staphylococcal enterotoxin I, whereas SPE-J is most closely related to SPE-C. Recombinant forms of SPE-I and SPE-J were mitogenic for PBL, both reaching half maximum responses at 0.1 pg/ml. Evidence from binding studies and cell aggregation assays using a human B-lymphoblastoid cell line (LG-2) suggests that both toxins exclusively bind to the polymorphic MHC class II β-chain in a zinc-dependent mode but not to the generic MHC class II α-chain. The results from analysis by light scattering indicate that SPE-J exists as a dimer in solution above concentrations of 4.0 mg/ml. Moreover, SPE-J induced a rapid homotypic aggregation of LG-2 cells, suggesting that this toxin might cross-link MHC class II molecules on the cell surface by building tetramers of the type HLA-DRβ–SPE-J–SPE-J–HLA-DRβ. SPE-I preferably stimulates T cells bearing the Vβ18.1 TCR, which is not targeted by any other known SAg. SPE-J almost exclusively stimulates Vβ2.1 T cells, a Vβ that is targeted by several other streptococcal SAgs, suggesting a specific role for this T cell subpopulation in immune defense. Despite a primary sequence diversity of 51%, SPE-J is functionally indistinguishable from SPE-C and might play a role in streptococcal disease, which has previously been addressed to SPE-C.
Streptococcus pyogenes is a major human pathogenic bacterium that causes a wide range of diseases including acute tonsillitis, streptococcal toxic shock syndrome, scarlet fever, necrotizing fasciitis, cellulitis, and bacteremia (1, 2, 3, 4). This Gram-positive bacterium produces a variety of exotoxins, known as streptococcal pyrogenic exotoxins (SPEs),3 which are believed to be involved in pathogenicity or virulence. Together with the staphylococcal enterotoxins (SEs) and the toxic shock syndrome toxin (TSST) produced by Staphylococcus aureus, they build a larger family of structurally related proteins (5, 6, 7). These proteins are also known as superantigens (SAgs), due to their ability to stimulate large populations of T cells (8, 9). In contrast to conventional Ags, SAgs are not processed inside APCs, but instead directly bind to the MHC class II protein outside the Ag binding groove (10, 11, 12, 13, 14). Simultaneously, they bind to all TCRs bearing particular Vβ regions (15, 16). This trimolecular complex subsequently cross-links a large number of APCs and T cells resulting in the production of high systemic levels of the cytokines TNF-α and IL-1β and of T cell mediators, such as IL-2 and IFN-γ (8, 17, 18, 19). Thus far, four streptococcal SAgs have been identified after purification from cell culture supernatants. These are SPE-A (20), SPE-C (21), streptococcal mitogenic exotoxin Z (SMEZ) (22), and streptococcal SAg (SSA) (23). Recently, two novel sag genes (spe-g and spe-h) and one incomplete sag gene (spe-j) have been identified by screening the incomplete S. pyogenes M1 genome database at Oklahoma University (24, 25). The predicted superantigenic properties of SPE-G and SPE-H have been confirmed by biochemical and immunological analysis of the corresponding recombinant proteins (24). SPE-B and SPE-F were originally added to the list of streptococcal SAgs, but this has been controversial. Both proteins are genetically unrelated to the streptococcal and staphylococcal SAgs, and the superantigenic properties of SPE-B (streptococcal cysteine protease) were shown to be due to contamination (15). There are now crystal structures for 11 SAgs: SPE-A (26), SPE-C (27), SPE-H (28), SMEZ-2 (28), and SSA (29), and the staphylococcal toxins SEA (30), SEB (31), SEC2 (32), SED (33), SEH (34), and TSST (35). Despite the limited primary sequence homology (sometimes <25%), all structures show a conserved folding pattern, comprising a NH2-terminal β-barrel globular domain and a COOH-terminal globular domain based on a β-grasp motif. 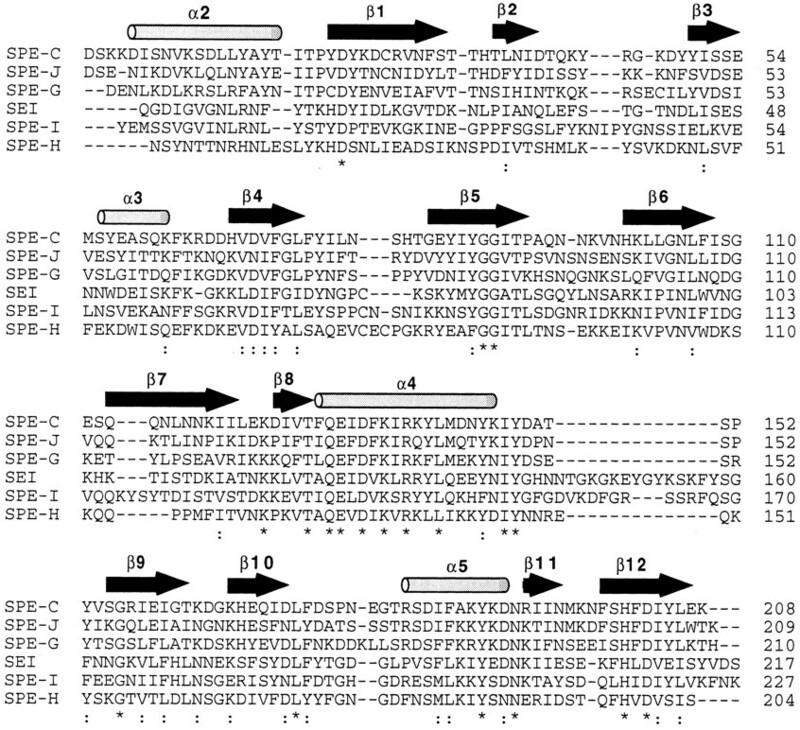 All examined staphylococcal SAgs, as well as the streptococcal SSA and SPE-A, have a generic binding site for the invariant α-chain of MHC class II located in the NH2-terminal domain (10, 19). In contrast, SPE-C, SPE-G, SPE-H, and all SMEZ variants bind the polymorphic MHC class II β-chain, probably mediated by a zinc coordination complex between three SAg residues and the highly conserved His81 of the HLA-DR1 β-chain (24, 27, 36). SEA and SEE combine both binding modes to cross-link MHC class II molecules. This appears to be a requirement for inflammatory cytokine production (37, 38). SPE-C possesses an alternative mechanism for cross-linking MHC class II by forming homodimers via the NH2-terminal domains (27, 36). Recently, the S. pyogenes M1 genome sequencing project was completed. A repeated screen of this database identified the missing 5′ end of the spe-j gene and another novel sag gene that is identical with spe-i. Spe-i was first described by McLaughlin et al., who mapped this gene location to a position just 5′ of the spe-h gene (39). Here, we report the cloning and expression of the spe-i and spe-j genes and the functional analysis of their recombinant proteins. 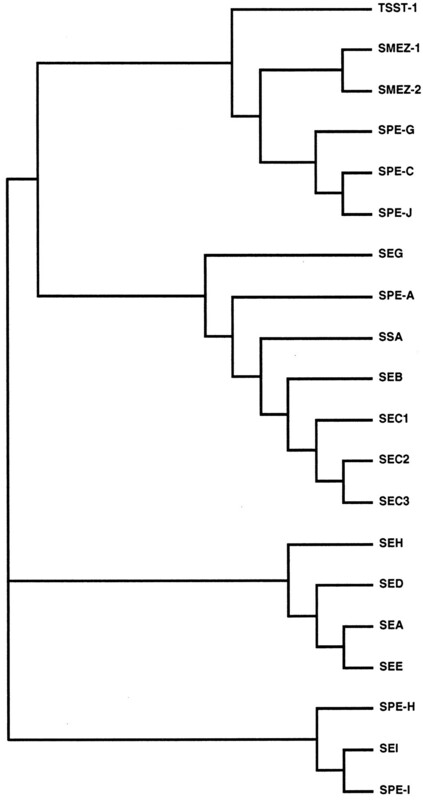 SPE-I and SPE-J were identified by searching the S. pyogenes M1 genome database at the University of Oklahoma (http://www.genome.ou.edu/strep.html) as described previously (24). The open reading frames were defined by translating the DNA sequences around the matching regions and aligning the protein sequences to known SAgs using the computer program Gap. The leader sequences were predicted using the SP Scan program. Gap and SP Scan are part of the Genetic Computer Group (GCG) package (version 8). Multiple alignments and dendrograms were performed with ClustalW (40) and TreeView 1.5.3 (41). Fifty nanograms of S. pyogenes M1 strain SF 370 (700294; Americation Type Culture Collection, Manassas, VA) genomic DNA was used as a template to amplify the spe-i DNA by PCR using the primers spe-i-fw (GGATCCATGAGTAGTGTGGGAGTTATTAA) and spe-i-rev (AAGCTTTTATTTATTAAATTTAACTAAG) and Taq Polymerase (Promega, Madison, WI). The primers contain a terminal tag with the restriction enzyme recognition sequences BamHI and HindIII, respectively. The amplified DNA fragment encoding the mature protein without the predicted leader sequence was cloned into a T-tailed pBlueScript SKII vector (Stratagene, La Jolla, CA). Spe-j was cloned in a similar approach, using the primers spe-j-fw (GGATCCGATAGTGAAAATATTAAAGCG) and spe-j-rev (GAATTCGCTCCTATCTTATTTAGTCC), which contain a terminal tag with the restriction enzymes BamHI and EcoRI. The DNA sequences of the subcloned toxin genes were confirmed by the dideoxy chain termination method using a Licor automated DNA sequencer. As the DNA sequences from the genomic database are all unedited raw data, three subclones of every cloning experiment were analyzed to insure that no Taq polymerase-related mutations were introduced. Subcloned spe-i and spe-j fragments were cut from pBlueScript SKII vectors using restriction enzymes BamHI/HindIII and BamHI/EcoRI, respectively (Life Technologies, Grand Island, NY) and cloned into pGEX-3c expression vectors. This vector is a modified version of pGEX-2T (Pharmacia, Piscataway, NJ) that expresses the highly specific protease 3C cleavage site (EVLFQ/GP) from a picornavirus just upstream of the inserted DNA (42). 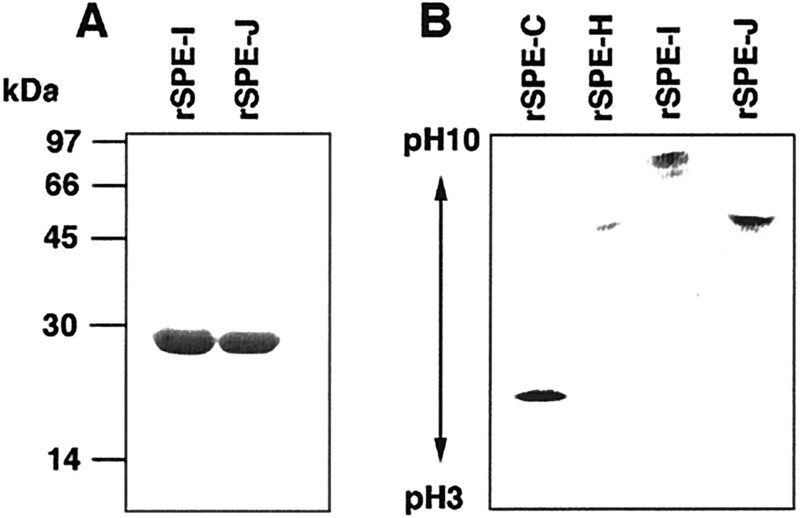 Recombinant SPE-I and rSPE-J were expressed in Escherichia coli DH5α cells as GST fusion proteins. Cultures were grown at 30°C and induced for 3–4 h after adding 0.2 mM isopropyl-β-d-thiogalactopyranoside (IPTG). The GST fusion proteins were purified on glutathione agarose as described previously (24). The mature toxins were cleaved off from GST using protease 3c (provided by Keith Hudson, University of Oxford, Oxford, U.K.) overnight at room temperature. The recombinant toxins were further purified by two rounds of cation exchange chromatography using carboxy methyl Sepharose (Pharmacia). All purified recombinant toxins were tested on a 12.5% SDS-polyacrylamide gel according the procedure of Laemmli. The isoelectric point (pI) of the recombinant toxins was determined by isoelectric focusing on a 5.5% polyacrylamide gel using ampholine, pH 3–10 (Pharmacia Biotech, Uppsala, Sweden). The gel was run for 90 min at 1 W constant power. Human PBLs were purified from the blood of a healthy donor by Histopaque Ficoll (Amersham, Arlington Heights, IL) fractionation. The PBL were incubated in 96-well round-bottom microtiter plates at 105 cells per well with RPMI-10 (RPMI 1640 with 10% FCS) containing varying dilutions of recombinant toxins. After 3 days, 0.1 μCi [3H]thymidine was added to each well, and cells were incubated for another 24 h. Cells were harvested and counted on a scintillation counter. Vβ enrichment analysis was performed by anchored multiprimer amplification (16). Human PBLs were incubated with 20 pg/ml of recombinant toxin at 106 cells/ml for 3 days. A 2-fold volume expansion of the culture followed with medium containing 20 ng/ml IL-2. After another 24 h, stimulated and resting cells were harvested, and RNA was prepared using Trizol reagent (Life Technologies). A 500 bp β-chain DNA probe was obtained by anchored multiprimer PCR, radiolabeled, and hybridized to individual Vβs, and a Cβ DNA region was dot blotted on a nylon membrane. The membrane was analyzed on a Molecular Dynamics (Sunnyvale, CA) Storm Phosphor imager using ImageQuant software. Individual Vβs were expressed as a percentage of all the Vβs determined by hybridization to the Cβ probe. The protein structures of SPE-I and SPE-J were created on a Silicon Graphics computer using InsightII/Homology software. The SAgs SMEZ-2 and SPE-C were used as reference proteins to determine structurally conserved regions (SCRs) for the SPE-J model. SPE-I was modeled onto the SPE-H structure. Coordinate files for SMEZ-2 (1ET6), SPE-C (1AN8), and SPE-H (1ET9) were downloaded from the Brookhaven Protein Database. The primary amino acid sequences of the reference proteins and SPE-I or SPE-J were aligned, and coordinates from superimposed SCRs were assigned to the model proteins. The loop regions between the SCRs were generated by random choice. Swiss-PdbViewer software (43) was used for displaying the computer-generated image. Recombinant toxin was radioiodinated by the chloramine T method as previously described (36). Labeled toxin was separated from free iodine by size exclusion chromatography using Sephadex G25 (Pharmacia). LG2 cells were used for cell binding experiments, as described (36). Briefly, cells were harvested, resuspended in RPMI-10, mixed at 106 cells/ml with 125I-tracer toxin (1 ng) and 0.0001–10 μg of unlabeled toxin, incubated at 37°C for 1 h. After washing with ice-cold RPMI 1640 the pelleted cells were analyzed in a gamma counter. For zinc binding assays the toxins were incubated in RPMI-10 alone, in RPMI-10 with 1 mM EDTA, or in RPMI-10 with 1 mM EDTA 2 mM ZnCl2. For competitive binding studies, 1 ng of 125I-tracer toxin (rSPE-I, rSPE-J, or rSEA) was incubated with 0.0001–10 μg of unlabeled toxin (rSPE-I, rSPE-J, rSPE-C, rSEA, rSEB, and rTSST) for 1 h.
LG-2 cells were washed, vigorously resuspended in RPMI-10 at 5 × 105 cells/ml, and aliquoted as a single cell suspension to a 96-well flat-bottom plate in a final volume of 100 μl, as described previously (36). Cells in duplicate wells were stimulated by the addition of 2 μg of toxin. 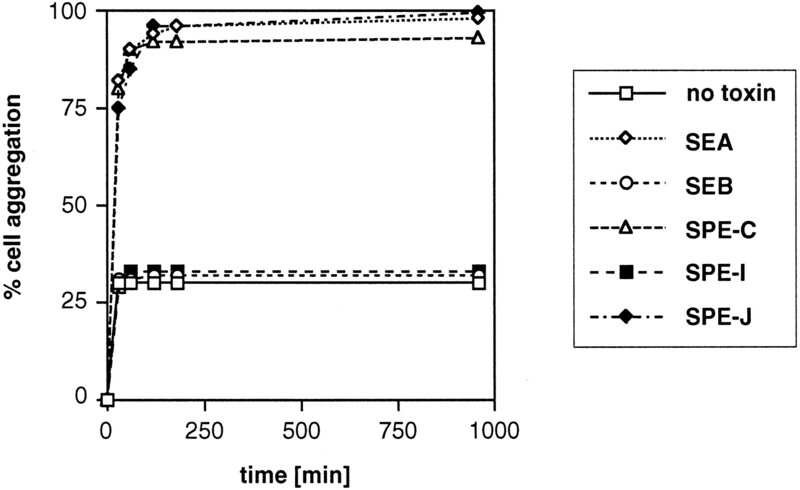 Aggregation was scored at various time points after incubation at 37°C as the percentage of LG-2 cells in aggregates, and was determined by light microscopy. Percent aggregation was determined by counting the number of cells not bound to an aggregate. Dynamic light scattering was performed using a Protein Solutions (Charlottesville, VA) DynaPro molecular sizing instrument fitted with a microsampler (44). Typically, 14 μl of protein solution was used and 40 measurements were taken for each sample. Samples ranged in concentration from 0.4 to 11.2 mg/ml. Dynamic light scattering enables the determination of the translational diffusion coefficient (Dt) from which the hydrodynamic radius (RH) of the particles in solution can be calculated using the Stokes-Einstein equation. Relative molecular masses for the molecules in solution can then be calculated from RH using an empirical standard curve which gives the equation: Mr = (1.549RH)2.246. Recently we reported the identification of an incomplete novel sag gene, called spe-j, from the unfinished S. pyogenes genome database at Oklahoma University (24). The recent completion of the sequencing project allowed us to locate the complete spe-j gene. This database search also revealed another sag gene that is identical with spe-i, described by McLaughlin et al. (39). The extracellular form of the SPE-I protein is predicted to comprise 227 aa residues, corresponding to a calculated molecular mass of 25.96 kDa and a pI of 8.37. SPE-I is most closely related to SEI (39.7% identity and 51.9% similarity; Ref. 45) and to SPE-H (30.5%/40.4%). This builds a separate subgroup in the SAg family tree (Fig. 1⇓). The amino acid sequence of the mature SPE-J was predicted to comprise 209 residues, and the molecular mass was calculated to be 24.56 kDa with a theoretical pI of 7.54. SPE-J builds a subgroup with SPE-C, SMEZ, and SPE-G and is most closely related to SPE-C (48.8%/56.5%) (Fig. 1⇓). SAg family tree. The family tree was created using Clustal W (38 ) and TreeView (39 ) computer programs and is based on primary amino acid sequence homology. SPE-J is closely related to SPE-C, SPE-G, and SMEZ, whereas SPE-I builds a subfamily with SEI and SPE-H. Multiple sequence alignments of SAg protein sequences showed that homologies are mainly clustered within structure-determining regions, in particular the α4, α5, β4, and β5 regions (Fig. 2⇓). This homology is characteristic for all streptococcal and staphylococcal SAgs and the basis for the well conserved SAg structure (28). Also conserved is a primary zinc-binding motif (H-X-D) close to the COOH terminus of SPE-I and SPE-J, suggesting that both novel SAgs might bind to the MHC class II β-chain in a similar mode as SPE-C by forming a zinc coordination complex (27). Multiple alignment of SAg protein sequences. The amino acid sequences of mature SAgs were aligned using the Clustal W program (38 ). The boxes above the sequences indicate the structural regions of SPE-C, as determined from the crystal structure (27 ). The conserved amino acid residues are labeled with asterisks, and regions with high similarity are indicated by colons. Regions with highest homology correspond to the β4, β5, and α5 regions in SPE-C.
To produce recombinant protein of SPE-I and SPE-J, individual genes (coding for the mature toxins without leader peptide) were amplified by PCR from S. pyogenes M1 genomic DNA and subcloned for DNA sequencing. DNA inserts with confirmed DNA sequence were then transferred into pGEX-3c expression vector and expressed as GST fusion proteins. GST-SPE-I and GST-SPE-J were completely soluble and gave yields of 25–30 mg/liter E. coli culture. The toxins were released from GST by cleaving with 3c protease and separated by two rounds of cation exchange chromatography. The recombinant proteins differ from their native counterparts by four additional N-terminal residues (Gly-Pro-Gly-Ser) introduced by the BamHI restriction site and the protease 3c recognition site. However, a potential influence on the function of the recombinant proteins seems rather unlikely, as the crystal structures of the most closely related SAgs (SMEZ-2, SPE-C, and SPE-H) show that the N terminus is facing away from both the TCR and the MHC class II binding site (27, 28). The purified toxins were analyzed by SDS-PAGE and isoelectric focusing (Fig. 3⇓). Both toxins ran as single protein bands on the SDS-PAGE gel confirming the purity of the preparation. The isoelectric focusing gel (Fig. 3⇓B) revealed a pI of approximately 9 for rSPE-I, which is the most basic pI of all known SPEs. The pI of SPE-J was estimated at 7–7.5 and is similar to SPE-H.
Gel electrophoresis of purified rSPE-I and rSPE-J. A, Two micrograms of purified rSPE-I and rSPE-J were run on a 12.5% SDS-polyacrylamide gel to show the purity of the preparations. B, Two micrograms of the recombinant toxins were run on an isoelectric focusing gel (5.5% PAA, pH 3–10). rSPE-I possesses the most basic pI of all known SPEs estimated at pH 9. The pI of rSPE-J was estimated at pH 7–7.5 and is similar to rSPE-H.
Western blot analysis with polyclonal Abs raised against rSPE-I and rSPE-J in rabbits showed that some, but not all, spe-i and spe-j carrying S. pyogenes isolates produce and secrete the native forms of the two toxins (data not shown). A standard [3H]thymidine incorporation assay was performed to test for the potency of rSPE-I and rSPE-J to stimulate PBLs. Both toxins gave half maximum responses (P50 value) of 0.1 pg/ml and were still active at concentrations <1 fg/ml. Together with SPE-C, which also gives a half maximum response at 0.1 pg/ml, SPE-I and SPE-J belong to the group of the most potent streptococcal SAgs. Only SMEZ-2 with a P50 value of 0.02 pg/ml is more potent, whereas SPE-G and SPE-H are less potent with P50 values of 2 and 50 pg/ml, respectively (24). The human TCR Vβ specificity of rSPE-I and rSPE-J was determined by multiprimer anchored PCR and dot-blot analysis using a panel of 21 human Vβ DNA regions. The Vβ enrichment after stimulation with toxin was compared with the Vβ profile of unstimulated PBLs (Table I⇓). Recombinant SPE-I almost exclusively targeted Vβ18.1 TCR, which was enriched 14.2-fold over the unstimulated PBLs. Minor enrichment of Vβ 5.3, Vβ 9.1, and Vβ 22a (2.7-, 2.5-, and 2.8-fold, respectively) was also observed. Stimulation of PBLs with rSPE-J resulted in significant proliferation of T cells carrying the Vβ2.1 TCR (7.9-fold enrichment) and minor enrichment of Vβ8.1 TCR (2.1-fold). The total of all Vβs stimulated by rSPE-I and rSPE-J was ∼100%, suggesting that all targeted Vβ regions were included in the panel. Structural and biochemical data suggest that SPE-C, SPE-H, and SMEZ-2 bind MHC class II exclusively at the polymorphic β-chain (24, 36). This binding is characterized by a zinc coordination complex, in which three zinc ligands are provided by the COOH-terminal domain of the toxins; the fourth residue is believed to be H81 of the HLA-DR1 β-chain. The region homologous to the α-chain binding face of SEA and SEB (β1-β2 loop) shows major structural differences in these toxins (27, 28). The hydrophobic residues in the β1-β2 loop (F44, L45, and Y46 in SEB) that are important for MHC α-chain binding are substituted by less hydrophobic residues (T33, T34, and H35 in SPE-C; K28 and T29 in SMEZ-2; V34, T35, and S36 in SPE-H). To compare the protein structure of SPE-I with known SAg structures SPE-I was modeled onto the SPE-H crystal structure and SPE-J was modeled on the SCRs of both SPE-C and SMEZ-2 (Fig. 4⇓). Computer-generated models of protein structures. Protein models of SPE-I and SPE-J were created on a Silicon Graphic computer using InsightII/Homology software and compared with the crystal structures of SMEZ-2 (28 ), SPE-C (27 ), SPE-H (28 ), and SEB (19 ). SPE-I was modeled onto the SPE-H protein structure, and SPE-J was modeled onto superimposed SCRs of SPE-C and SMEZ-2. The Swiss-PdBViewer software (41 ) was used to display the protein structures. Both models show a potential zinc binding site within the β-grasp motif that might be used for binding to the HLA-DR β-chain. The β1-β2 loop that corresponds to the HLA-DR1 α-chain binding site is shown on the right site of the protein structures. In SPE-I, this loop is composed of hydrophobic residues, suggesting a potential binding site for HLA-DRIα, similar to SEB. The β1-β2 loop in SPE-J is less hydrophobic and identical with SPE-C, suggesting the lack of an α-chain binding site. The resulting models predicted three potential zinc binding ligands: H179, D219, and H217 in SPE-I, and H167, H201, and D203 in SPE-J. Interestingly, the third ligand in SPE-I (H179) is located on the β9 strand corresponding to D160 in SPE-H, whereas the third ligand in SPE-J is provided by the β10 strand, similar to H167 in SPE-C.
A comparison of the β1-β2 loop region of SPE-I and SPE-J revealed significant differences between the two toxins. In the SPE-I model, this loop region consists of the hydrophobic residues L35, F36, and Y37, which correspond to F44, L45, and Y46 of the MHC class II α-chain binding region in SEB. In contrast, the β1-β2 loop of SPE-J consists of the less hydrophobic residues T32, T33, and H34 and is identical with the equivalent region in SPE-C (T33, T34, and H35). The similarity of the β1-β2 region of SPE-I in the computer-modeled protein structure to SEB suggests that it might have two binding sites for MHC class II, similar to SEA (38), whereas SPE-J might only bind to the MHC class II β-chain, similar to SPE-C (27, 36). The predicted requirement for zinc was confirmed by a binding assay using LG-2 cells, a MHC class II expressing cell line homozygous for HLA-DR1. Direct binding of 125I-labeled SPE-I or SPE-J was completely abolished in the presence of 1 mM EDTA, but could be restored after adding an excess of 2 mM ZnCl2 (Fig. 5⇓). These results show that both toxins bind to MHC class II in a zinc-dependent mode, most likely targeting the H81 of the MHC class II β-chain. However, this does not exclude the possibility of an additional binding site for the MHC class II α-chain. It has been shown that SEA binds to the generic α-chain with ∼100 times lower affinity compared with the zinc-dependent β-chain binding site, and cooperative effects might also play an important role (38). Zinc-dependent binding of rSPE-I and rSPE-J to LG-2 cells. One nanogram of radioiodinated rSPE-I (A) or rSPE-J (B) was incubated with LG-2 cells and increasing amounts of unlabeled toxin for 1 h at 37°C. Then the cells were washed and counted. Binding of the toxins to LG-2 was abolished at the presence of 1 mM EDTA and could be completely restored by addition of 2 mM ZnCl2. Competition experiments between SPE-I or SPE-J and other toxins were performed in an attempt to gain further insight into the orientation of the toxins on MHC class II. Recombinant SPE-I, rSPE-J, and rSEA were radiolabeled with 125I and tested with excess of unlabeled toxins for binding to LG-2 cells (Fig. 6⇓). Unlabeled SPE-C, SPE-I, and SEA significantly inhibited 125I-SPE-J binding to LG-2 cells (Fig. 6⇓A). SPE-C prevented 125I-SPE-J binding as well as SPE-J itself, whereas SEA and SPE-I were only slightly less competitive than SPE-J. In contrast, no inhibition was observed with SEB and TSST, even in 10,000-fold molar excess. Both SEB and TSST bind exclusively to the MHC class II α-chain (19, 35), whereas SEA binds to both α- and β-chain (37). In a reciprocal experiment, SPE-J only partially inhibited binding of 125I-SEA to LG-2 cells (Fig. 6⇓C), suggesting competition for the β-chain, but not for the α-chain. Competition binding studies with radiolabeled rSPE-I (A), radiolabeled SPE-J (B), and radiolabeled rSEA (C). LG-2 cells were incubated with 1 ng of 125I-labeled toxin and increasing amounts of unlabeled toxin. After 1 h cells were washed and counted. Competition studies with radioiodinated SPE-I showed that SPE-C fully inhibits the binding of SPE-I to LG-2 cells, whereas SEA and TSST only partially competed with 125I-SPE-I binding (Fig. 7⇓B). In contrast, SEB did not prevent SPE-I binding to LG-2 cells. In the reciprocal experiment, SPE-I partially inhibited SEA binding, similar to SPE-J (Fig. 6⇑C). Homotypic aggregation in LG-2 cells. Nonaggregated LG-2 cells were incubated with 2 μg/ml of recombinant toxin in a flat-bottom 96-well plate and monitored for cell aggregation during a period of 16 h. Like rSEA and rSPE-C, rSPE-J induced a rapid cell aggregation detectable after only 30 min, whereas incubation with rSPE-I only resulted in background aggregation. SEA and SPE-C rapidly induce homotypic aggregation of LG-2 cells (36). This activity presumably reflects the ability to cross-link MHC class II molecules on the cell surface by binding simultaneously to both MHC class II chains (SEA) or by homodimerization of the toxin (SPE-C). Recombinant SPE-I and rSPE-J were tested for their ability to induce LG-2 cell aggregation (Fig. 7⇑). SPE-J was found to be as potent as SEA and SPE-C showing significant cell aggregation after only 30 min and inducing almost complete cell aggregation after 3 h. In contrast, cells incubated with SPE-I showed only marginal aggregation, similar to cells incubated with SEB or without toxin. The rapid homotypic aggregation of LG-2 cells suggests that SPE-J is capable of cross-linking MHC class II molecules. However, it seems unlikely that SPE-J, like SEA, simultaneously binds to both MHC class II chains as the α-chain binding toxins SEB and TSST could not prevent SPE-J from binding to LG-2 cells in competition studies. SPE-C has surrendered its generic α-chain binding site in favor of a dimerization interface, thereby creating a novel mode of MHC class II cross-linking (27). The computer-generated model of SPE-J shows a strong conservation within this region suggesting a similar mode of action for this toxin. Dynamic light scattering was used to determine whether SPE-J forms dimers in solution (Table II⇓). Results from light scattering indicate that both SPE-J and SPE-C form dimers in a concentration-dependent manner. Both SAgs are dimeric at high protein concentrations (>5 mg/ml for SPE-J and >10 mg/ml for SPE-C). Conversely, at low concentrations the light scattering data suggest that these SAgs are monomeric. SMEZ-2 was used as a control and shows a monomer in solution over the concentration range 0.4–9.3 mg/ml. Concentration-dependent dimerization may facilitate MHC-II cross-linking at the cell surface where the local concentration of SAg greatly exceeds that in the surrounding milieu. Recently, we reported the identification of novel streptococcal SAg genes including the incomplete spe-j gene by mining the S. pyogenes M1 genome database at the University of Oklahoma. This paper describes the cloning of the complete spe-j gene and yet another novel sag gene from the M1 strain (spe-i), followed by expression and functional analysis of the recombinant proteins. 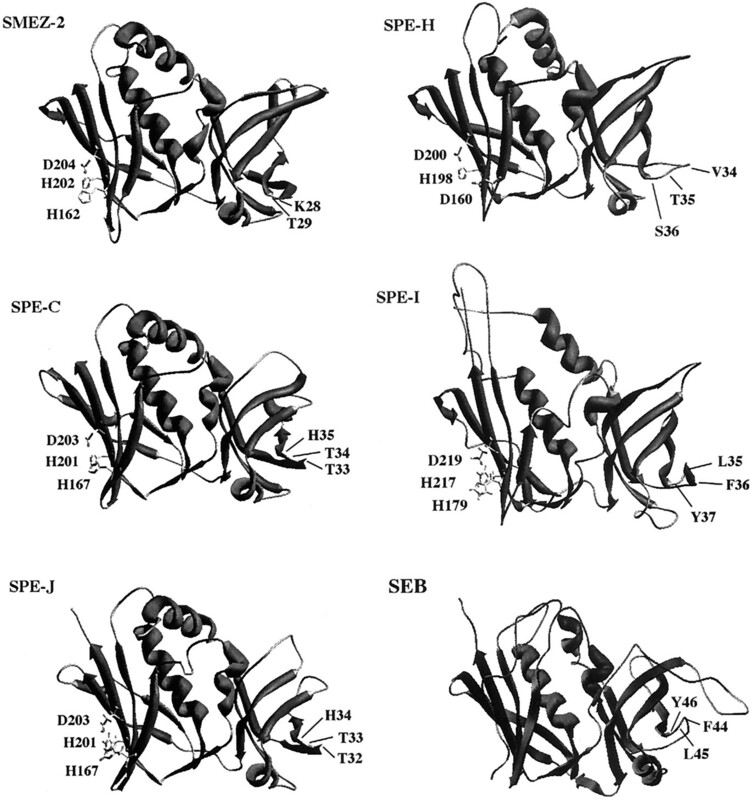 The novel proteins are clearly related to SPEs and the SEs, which are part of the SAg family. Although the overall amino acid sequence identity to their nearest homolog is not particularly high (39.7% between SPE-I and SEI and 48.8% between SPE-J and SPE-C) the regions that are important for the characteristic SAg fold are highly conserved. These regions are α4, α5, β4, and β5. Recombinant forms of both SPE-I and SPE-J are extremely potent stimulators of human PBL at nanomolar concentrations, confirming their role as SAgs. The data presented in this paper suggest that both SPE-I and SPE-J bind to the MHC class II β-chain but not to the α-chain. Evidence that supports this assumption comes from computer-generated protein models, zinc-dependent binding to LG-2 cells, competition experiments with other well characterized toxins, and cell aggregation assays. A putative zinc binding motif for both SPE-I and SPE-J was identified from structural modeling, and this was confirmed by the results showing that binding of SPE-I and SPE-J to MHC class II on LG-2 cells was completely inhibited by EDTA and restored with an excess of ZnCl2. The similarity of these putative sites to those identified in the crystal structures of SEA and SPE-C strongly suggest that Zn2+-dependent binding to the conserved H81 in the MHC class II β-chain is the most likely mode of binding for SPE-I and SPE-J. The protein model of SPE-J also predicted a strong similarity to SPE-C in the β1-β2 loop region to the opposing face to the zinc site. In SEA and SEB, hydrophobic residues on this loop project into a hydrophobic depression in the MHC class II α1 domain (19). These hydrophobic residues are absent in SPE-C (27) and SPE-J suggesting that, like SPE-C, SPE-J also lacks a binding site for the MHC class II α-chain. Further evidence for this was provided by the results showing that neither SEB nor TSST inhibited binding of SPE-J to LG-2 cells, whereas SEA and SPE-C were strongly competitive. SPE-C was as effective as SPE-J, suggesting similar binding affinities. In a reciprocal experiment, SPE-J inhibited SEA binding by ∼50–60%, suggesting that competition only occurred at the MHC class II β-chain but not at the α-chain. The hydrophobic β1-β2 loop in SPE-I was sufficiently similar to the same region in SEB to suggest that this SAg possesses a MHC class II α-chain binding site. However, cell aggregation studies, which are a measure of MHC class II cross-linking, did not confirm this. SEA induced rapid aggregation of LG-2 cells, whereas SPE-I was negative in this assay. The results from competition studies also suggest that SPE-I does not bind to the MHC class II α-chain. SPE-I prevented SEA and SPE-C binding but did not inhibit SEB and only partially inhibited TSST. This might be due to interference between the two proteins across the top of the MHC class II molecule rather than competition for the same MHC class II site. Although TSST binds exclusively to the MHC class II α-chain, its binding position is shifted over the top of the MHC class II molecule toward the β-chain (10). SPE-J induced rapid homotypic aggregation of LG-2 cells, suggesting a binding mode that results in cross-linking of MHC class II molecules on the cell surface. MHC cross-linking can be caused by toxins with binding sites for both MHC class II chains such as SEA (38), or by homodimerization of toxins like SPE-C, where the generic MHC class II α-chain binding site is transformed into a dimer interface (27). Due to the strong conservation between SPE-C and SPE-J within this region and the lack of suitable residues in the β1-β2 loop region to provide an effective MHC class II α-chain binding site, it is assumed that SPE-J instead forms homodimers. This hypothesis is supported by the results from dynamic light scattering analysis for purified rSPE-J, which shows that this SAg forms dimers in solution at concentrations above 5 mg/ml. This suggests that SPE-J may form tetramers of the type HLA-DRβ–SPE-J–SPE-J–HLA-DRβ, similar to that proposed for SPE-C (27, 36). The completion of the S. pyogenes type M1 strain SF370 genome project allows for the first time to define the complete repertoire of SAgs from a particular organism. This strain carries seven spe genes coding for SPE-C, SPE-G, SPE-H, SPE-I, SPE-J, SSA, and SMEZ. The total number of streptococcal exotoxins in all strains is likely to be much higher, as several spe genes are located on mobile DNA elements such as phage or insertion element, which allows them to be transferred horizontally between different strains (7). The reason for the high diversity of sag genes is still unclear. The most significant difference between individual SAgs is their specificity in targeting T cell subpopulations carrying particular TCR Vβ regions. This Vβ specificity is often overlapping, and some Vβs are targeted more frequently than others. Our data show that SPE-I mainly stimulates T cells carrying the Vβ18.1 TCR. This TCR is not targeted by any other known SAg, which might indicate a specific role for SPE-I in activation of an immune response. In contrast, SPE-J almost exclusively targets the Vβ2.1 TCR, which is also triggered by SPE-A, SPE-C, SPE-G, SPE-H, and SMEZ, making it the most frequently targeted TCR by streptococcal SAgs (1, 24, 36). This selective targeting of one particular Vβ region is very intriguing and may suggest a specific role for Vβ2.1-bearing T cells in streptococcal induced immune response. Another intriguing finding is the functional similarity between SPE-C and SPE-J. Despite their 51% diversity in the primary amino acid sequence, both toxins share a common MHC class II β-chain binding site, a dimerization interface, and a Vβ2.1-specific TCR binding site. This indicates the extraordinary dynamic in the evolution of SAgs and the potential to create a large number of different functional SAgs. As shown in comparative studies of SAg crystal structures, only relative small core regions are necessary to maintain the typical overall SAg fold (28). Moreover, only minor differences in the primary amino acid sequence can create multiple antigenic variants, like SMEZ (up to 8% diversity; Ref. 46), or functional different toxins, which target different TCR Vβ regions like SEA and SEE (15% diversity; Ref. 16). The existence of two functionally indistinguishable SPEs suggests an important role in their modus operandi and their TCR specificity. This is also supported by the fact that Vβ2 is the most frequently targeted TCR by SPEs. But why should a bacterial isolate carry two different genes that code for functionally identical proteins? If antigenic variation alone were the driving force, then multiple alleles should be expected, as it has been shown for SMEZ (46). Genotyping of different S. pyogenes strains for spe-c and spe-j and possible allelic forms is currently underway to investigate this possibility. One explanation might be that SPE-C and SPE-J differ in a function yet to be discovered. Until today, it is not fully understood how bacteria benefit from the secretion of SAgs. Recent studies suggest that SAgs possess other functions in addition to the well known TCR Vβ-specific T cell mitogenicity. For example, cross-linking of MHC class II on the surface of APC by certain SAgs, like SEA, triggers the release of cytokines such as IL-1β and TNF-α (38). Sriskandan et al. showed a local dose-dependent increase of neutrophils after injecting mice with rSPE-A, suggesting that SPE-A might be involved in the recruitment of neutrophils to the site of infection (47). SPE-I and SPE-J might play a crucial role in streptococcal toxic shock syndrome and other severe streptococcal diseases. Several epidemiological studies showed a strong correlation between severe invasive disease and streptococcal isolates carrying genes for SPE-A and/or SPE-C (48, 49). However, several of these isolates lack the spe-a and spe-c genes, suggesting that they produce other SAgs that might be involved in disease. A selective expansion of T cells carrying the Vβ2.1 and Vβ8.1 TCR has been reported in patients with Kawasaki disease, an acute multisystem vasculitis of young children (50). The causative agent for this disease is unknown, but SAgs have been implicated, in particular SPE-C and TSST, which both target the Vβ2 TCR. A screening for the novel sag genes in clinical isolates from patients with severe invasive disease is currently underway to determine a possible correlation between novel SAgs and disease. We gratefully acknowledge the Streptococcal Genome Sequencing Project (funded by U.S. Public Health Service/National Institutes of Health Grant AI38406) and Bruce A. Roe, S. P. Linn, L. Song, X. Yuan, S. Clifton, M. McShan, and J. J. Ferretti. ↵1 This work was supported by the Health Research Council of New Zealand. ↵3 Abbreviations used in this paper: SPE, streptococcal pyrogenic exotoxin; SE, staphylococcal enterotoxin; TSST, toxic shock syndrome toxin; SAg, superantigen; SMEZ, streptococcal mitogenic exotoxin Z; SSA, streptococcal SAg; RPMI-10, RPMI 1640 with 10% FCS; SCRs, structurally conserved regions; pI, isoelectric point. Alouf, J. E., H. Mueller-Alouf, and W. Koehler. 1999. Superantigenic Streptococcus pyogenes erythrogenic/pyrogenic exotoxins. In The Sourcebook of Bacterial protein Toxins. J.E. Alouf and J.H. Freer, eds. Academic Press, San Diego. pp. 567–588. Ferretti, J. J., D. Ajdic, K. Lyon, S. Sezate, D. Savic, A. Suvorov, S. P. Lin, B. A. Roe, R. L. McLaughlin, and W. M. McShan. 1999. Genome Analysis of an M1 Strain of Streptococcus pyogenes. XIV. In Lancefield International Symposium on Streptococci and Streptococcal Diseases, October 11–15. Securacopy, New Zealand. McLaughlin, R. L., S. Sezate, and J. J. Ferretti. 1999. Molecular Characterization of Genes Encoding Streptococcal Erythrogenic Toxin-like Proteins SPE-H and SPE-I. XIV. In Lancefield International Symposium on Streptococci and Streptococcal Diseases, October 6–8. Securacopy, New Zealand.